Your guests will have fun with these edible chocolate puzzles! Each chocolate puzzle box contains 4 delicious chocolates that are pieces of the puzzles. 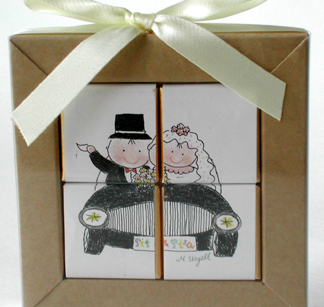 Each chocolate puzzle has a ribbon tied around the box and a clear plastic sleeve to hold the pieces together. Minimum order is 12. The price is per chocolate puzzle favor.